Officials say 24,000 kids crossed the border in the month of December alone. Declaring the U.S. immigration system had been "pushed to a breaking point by those who seek open borders," Homeland Security Secretary Kirstjen Nielsen on Wednesday ordered mandatory medical checks on all children under the age of 10 in U.S. custody and said she would send U.S. Coast Guard medical personnel to the border to help. Nielsen said she also planned to visit the border later this week to see "first-hand" how medical screenings were handled. Her statement came after a second child died this month after being in U.S. custody. Nielsen said that prior to the two deaths, it had been more than a decade since a child in died after being in U.S. custody. Officials said six adults in U.S. custody died in 2018. "Our system has been pushed to a breaking point by those who seek open borders," Nielsen wrote. "Smugglers, traffickers, and their own parents put these minors at risk by embarking on the dangerous and arduous journey north. "This crisis is exacerbated by the increase in persons who are entering our custody suffering from severe respiratory illnesses or exhibit some other illness upon apprehension," she said, noting that she also has asked federal health officials to investigate an uptick in illnesses among migrants. The change in procedures come as border authorities reported that some 24,000 kids have arrived at the border this month alone. Additionally, the area near El Paso, Texas was grappling with a tenfold increase in migration just as flu season gets under way. Migrants are often transported in close quarters to stations designed to house adult males, not large families. 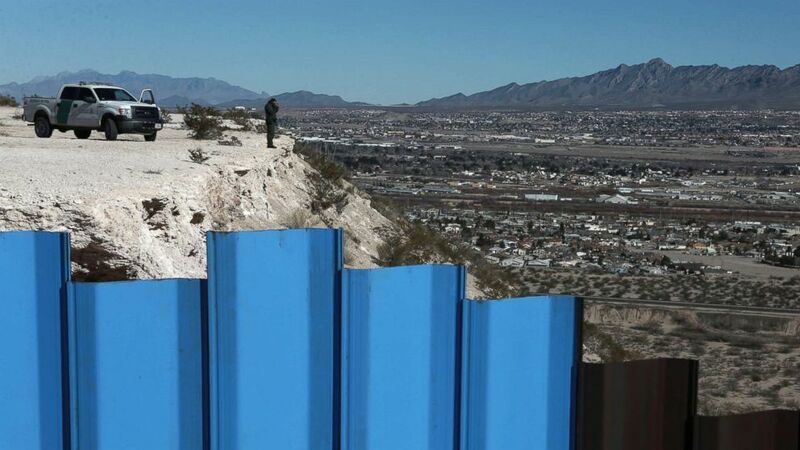 (Christian Torres/AP, FILE) An agent from the border patrol observes near the Mexico-US border fence on the Mexican side separating the towns of Anapra, Mexico and Sunland Park, N.M., Jan. 25, 2017. McAleenan and other officials have said they believe "coyotes," or smugglers, are going into poor Guatemalan towns and offering families cheap bus rides north under the promise that the U.S. government would allow them inside the country if they travel with children and claim asylum. “Our system is inviting [migrants] to take that risk," he said. 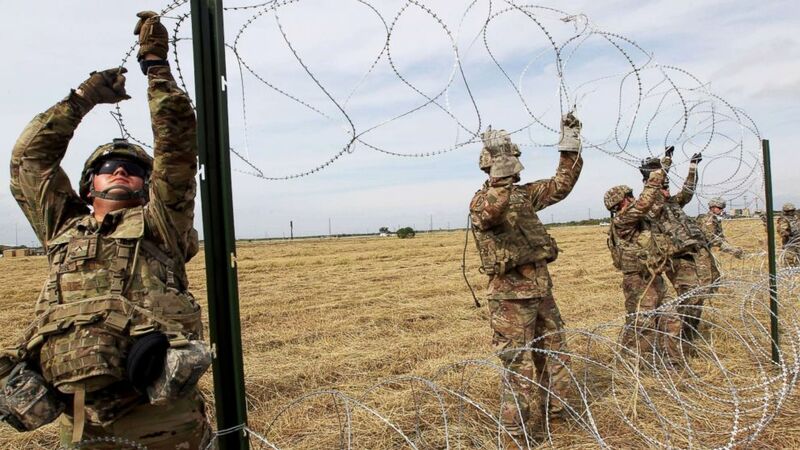 (Delcia Lopez/Reuters) Army soldiers from Ft. Riley, Kansas, put up razor wire fence for an encampment to be used by the military near the U.S. Mexico border in Donna, Texas, Nov. 4, 2018. The death of the 8-year-old Guatemalan boy minutes before Christmas Day -- identified by Rep. Joaquin Castro as Felipe Gomez Alonzo -- has raised questions about President Donald Trump's handling of the unfolding border crisis and what options U.S. authorities have going forward. As U.S. officials became aware that large groups of migrants were moving northward earlier this year, Trump ordered several thousand troops to the border, where they installed concertina wire and other physical barriers. Border authorities say what they need now are more detention beds, medical personnel and additional resources to process migrants, which are comprised primarily of parents and children. At the same time, border officials are legally restricted on how long they can detain families, providing few options about where to release the families. Trump has tweeted throughout the Christmas holiday about his insistence that Congress provide money for a border wall, but did not refer to the boy's death. "We've been sounding the alarms on this for months," an administration official said Wednesday of the influx of families at the border. The official, who spoke on condition of anonymity, said the administration's position was that it was time for "Congress and the courts" to act. Local officials in El Paso have accused Immigration and Customs Enforcement of dumping 200 migrants at a time at bus stations and at privately run shelters that say they are out of room. /> U.S. officials, however, say they have few options. Authorities are restricted from holding children for long periods of time in detention under a 1997 court settlement known as the Flores agreement. "After decades of inaction by Congress, the government remains severely constrained in its ability to detain and promptly remove families with no legal basis to remain in the U.S.," according to a statement released by U.S. Immigration and Customs Enforcement. "To mitigate the risk of holding family units past the timeframe allotted to the government, ICE has curtailed reviews of post-release plans from families apprehended along the southwest border. ICE is redoubling its efforts to work with local and state officials and NGO partners in the area so they are prepared to provide assistance with transportation or other services." Rep.-elect Veronica Escobar, D-Texas, told ABC News on Wednesday that she agrees border authorities need more resources to support families and that the Obama administration shares part of the blame because it didn't do more to respond to changing migration patterns. "It's a bipartisan problem," said Escobar. "This is something that should have been addressed four years ago." Administration officials told reporters on Wednesday that an internal government investigation was under way regarding the recent death in Alamogordo, New Mexico, just north of El Paso. The administration official who spoke to reporters on condition of anonymity declined to comment on whether the administration believed the local hospital acted appropriately by releasing the child with a high fever. But at one point, the official said medical personnel there "did all they could." A 7-year-old girl, Jakelin Caal Maquin, had died earlier this month. Officials said that since her death, additional emergency and medical personnel were placed along remote border checkpoints like the one where she arrived. Officials were in the process of investigating that death when the second child died. Another looming crisis is the estimated 15,000 children in custody in shelters across the country. These are mostly teens and older children who crossed alone and are waiting to be paired with sponsors. One shelter, Tornillo in Texas, has said it won't accept any more kids and is looking to close its doors by mid January.